Properties in Shoshone County average 4.8 out of 5 stars. Cozy Weekend get away with beautiful views! Property 1: Cozy Weekend get away with beautiful views! Quaint historic mining town nestled in the mountains between two ski resorts. Property 5: Quaint historic mining town nestled in the mountains between two ski resorts. Stay at the charming Wallace Haven! Property 6: Stay at the charming Wallace Haven! Beautiful mountain views! Perfect home base for exploring the area! Property 16: Beautiful mountain views! Perfect home base for exploring the area! Quiet Comfy Home with Views of the Gondola and Mountain-Private Hot Tub! Property 20: Quiet Comfy Home with Views of the Gondola and Mountain-Private Hot Tub! 4 queen beds, 2 bedroom, 2 bathroom, recently updated! Property 24: 4 queen beds, 2 bedroom, 2 bathroom, recently updated! Amazing Family Retreat In The Heart Of The Silver Valley! Property 37: Amazing Family Retreat In The Heart Of The Silver Valley! Beautiful home, as close to downtown Wallace as you can get. 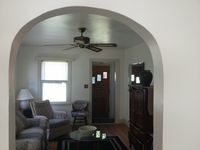 Property 43: Beautiful home, as close to downtown Wallace as you can get. The perfect size and location for our family. The little ones loved the 3rd floor game area. Such a beautiful historic home. Thank You! Stayed over Christmas break so we could ski everyday. 5-minutes to the Gondola. House was perfect for 2-Adults and 2-Kids. House is clean and has all the amenities. We enjoyed it so much we booked it again.